WellMed is a health care delivery system serving more than 300,000 patients in Texas and Florida. The WellMed Palliative Care Program is one of several sub specialty programs offered by WellMed. Patients are seen in the Primary Care Clinic office, Skilled Nursing Facility, and in their own home. The Palliative team consists of 30 staff members in the San Antonio Market. It is comprised of 4 MDs, 4 NPS, 8 RNs, 3 LVNS, 2 Social Workers, 9 Ancillary Staff Members. Strategies have been implemented by WellMed to prevent stress, distress and burnout in this subspecialty. Mindfulness Training, Kudos Cards, Reflection and Team Building activities are some of the strategies that have been implemented in the program to combat stress and burnout. In April 2017, the Palliative Care Team underwent a 6 week course in Mindfulness Training which was weekly for an hour via Web ex, Kudos cards were established to facilitate recognition of employees who went above and beyond in the their role, reflection is a time to honor our patients and the impact they make in our lives and lastly Team Building activities are conducted on a monthly basis to promote team unity. A qualitative analysis was done pre and post mindfulness training, along with a 7 question survey was distributed to all employees in the program to gage the impact of these activities in relation to decreased stress, and employee burnout. 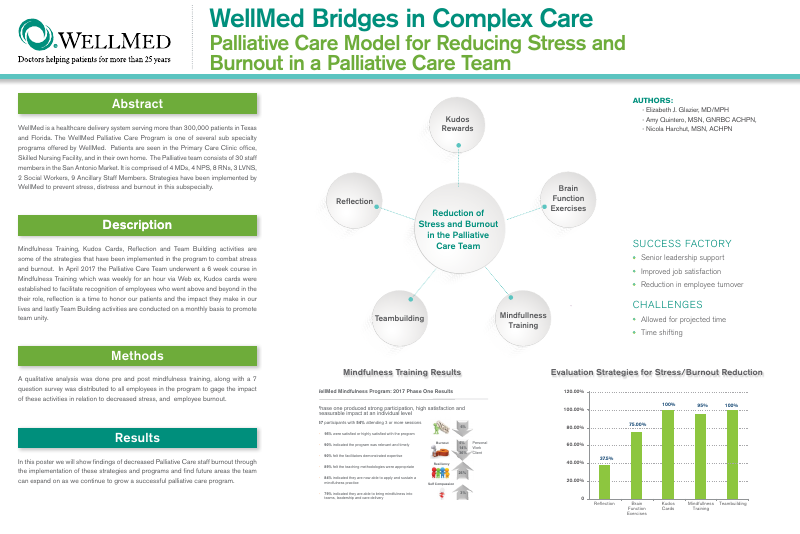 In this poster we will show findings of decreased Palliative Care staff burnout through the implementation of these strategies and programs and find future areas the team can expand on as we continue to grow a successful Palliative Care Program.